This product has been replaced by the Dirt Motel 2. Check it out now! Compactness and lightness are the most important qualities in the backpacking world. That’s why the TN2 tent was awarded the 2014 Backpacker Magazine Editors’ Choice and the 2016 Outside Magazine Gear of the Year awards. As part of the well-engineered TraiLogic™ Collection, it’s loaded with useful features like shorter 14-inch aluminum poles for easier packing, innovative hug-clip technology for simple setup, and a roll-up Stargazing Fly™ for nighttime enjoyment. You’ll also enjoy spacious floor space along with an oversized D-style door for convenient access. No wonder you’ll want to spend more nights on the trail. 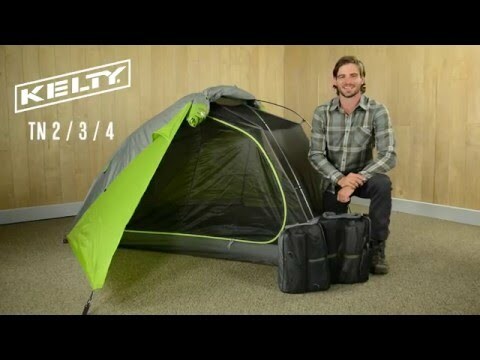 After 25+ years with my old Kelty tent I opted to 'update' and bought the TN2. What a mistake! Sure, my old tent was heavy, but it was waterproof and had held its ground through many a storm. This one leaks. The windows also FALL OUT! After not even a season of use, the first time I pulled it out this year the windows came unglued. 2 giant holes in your rain fly does nothing to improve your ability to stay dry in a storm, or even warm. Windows both delaminated - otherwise a good tent. Light weigh and easy to set up. That’s all you get. If you are expecting any wet weather you might as well sleep outside. The trianglar deign the the gram comes allows for water to pool and not run off the tent. Guaranteed to get wet if it rains. Great tent for the desert! The tent is light weight, easy setup and good ventilation for 3 seasons. Thought this tent was ok after a couple of uses. Only used a handful of times and unpacked it the other week in New Zealand customs only to find one of the windows on the fly had delaminated.....did not even think this was possible and unsure why. Anyway, I've tried to contact REI (original place of purchase) and they were of no help. Need to contact Kelty to see if they can help by repairing this problem. Tent drips water in rain in other sections, and also super annoying how the zipper always gets caught in the material when opening from the inside. This is a remarkable tent.